Too Young to Comment on Thatcher? Since when was a politician’s only effects felt when they were in office? When Winston Churchill was no longer prime minister, did the UK go back to war with Germany? When Tony Blair was replaced by Gordon Brown did we automatically pull out of Iraq? The policies and ideologies which Margaret Thatcher implemented during her period as prime minister are largely still with us today, so why can’t I comment on the life of a woman who has affected the world I was born into and have grown up in – just because I wasn’t around when she was in office? It really is tiring to justify yourself and your opinion to people older than you – so often you are given a patronising pat on the head like “Well done for trying, but you’re too young to understand.” I understand just fine, thank you. Child poverty during Thatcher’s government was the worst in the developed world at the time (the current Conservative government are doing their damnedest to surpass those levels, though – what a goal!). This surely was helped by her government putting countless working class people out of work by closing shipyards and coal mines, to name just two examples. The fact she was the UK’s first and only female prime minister meant almost nothing for women of her gender – she actively despised feminism and what it stood for, believing that the women’s liberation movement had gone far enough (in the 80s, really?). She actually proclaimed feminism to be “poison”, surrounded herself with powerful men – and certain publications have been trying to portray her as a feminist icon. Give me a break. Thatcher became an archetypal Conservative by her striving towards privatisation (aside from the NHS and National Rail, which have since been at least partially privatised by different Tory governments). She is the woman who is behind the massive electricity and gas bills you have received in the last few months, hiding it under the banner that prices will go down due to competition. Her political ideology has been picked up by Southern republican politicians over in the USA, and surely that can’t be seen by a positive thing. Ed Miliband, David Cameron and Nick Clegg all claim to have been influenced by her politics, further clarifying that all three have been cut from the same cloth – making all three of them unelectable, at least to me. Thatcherism is still alive and well today, it serves as a driving factor to widen the gap between the richest and poorest in this country. Frankly, it’s disgusting. Surely the only right thing for the current government to do is to provide Thatcher with a funeral/cremation, funded by the private sector. It’s what she would have wanted. I am bycotting all news sites and TV news until the woman is buried on 17th April. 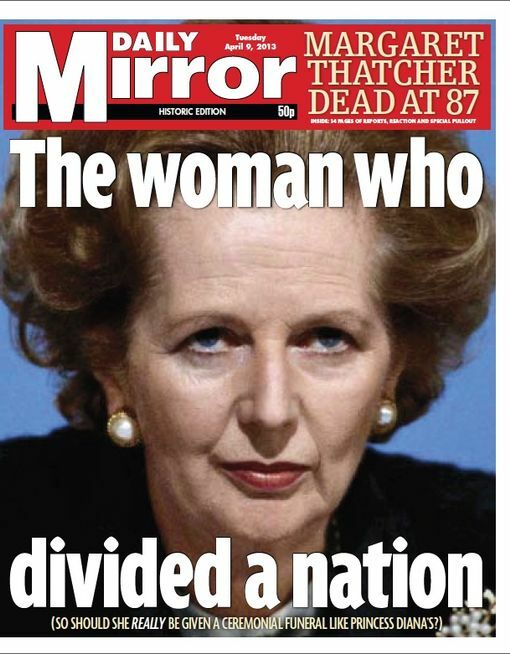 Good riddance to her, it’s just a shame her politics didn’t die with her.